Video Review: Coach Pat – The Shoulder Press, Push Press, and Push Jerk – How well do you perform these movements? When’s the last time you performed a Shoulder Press? 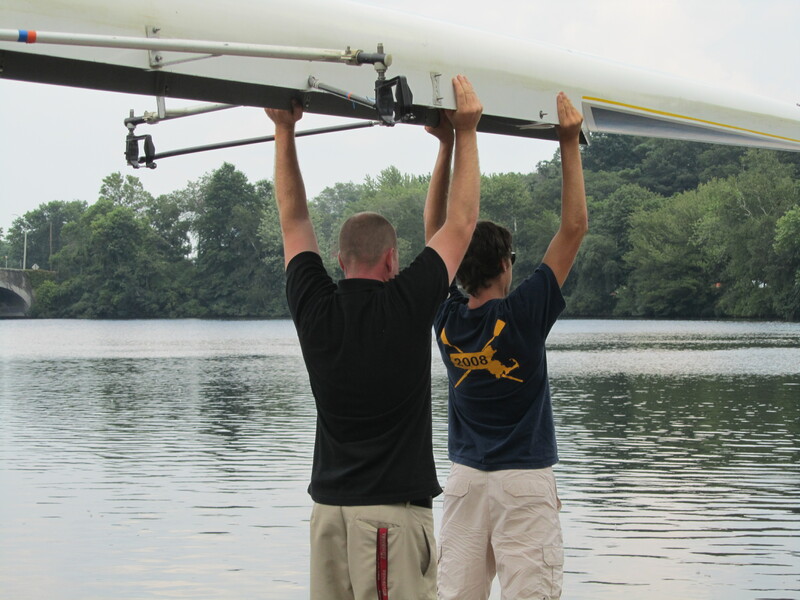 When’s the last time you lifted a boat from shoulders to overheads? For many of you in Boston and the Northern states it’s been a while, but that ice is almost gone and regular water practices will be happening in no time. Regardless, anytime you take a weight or external object from your shoulder to overhead, you are pressing, because that’s what a shoulder press is. It’s the strongest, most efficient way to move something from shoulder to overhead. If you need to move more weight and create more power the best movement becomes a push press. If you need to move even more weight and create maximum speed and power that movement becomes an Olympic Lift, the Push Jerk. I believe that if you can learn to move weight from your shoulder to overhead correctly you can and will become a better rower. The key is how you press and what you focus on. Here is a little video review of a pre-elite rower I’ve started working with. This is her form before any coaching. Check out what she’s doing well and what she can do better. Now take a look at my shoulder press, push press, and push jerk. What parts of these movements can we tie to the rowing stroke? I always teach the skills of 1. Posture, 2. Control, and 3. Connection whether it’s rowing or weightlifting. 3. Connection – How am I connected to the bar? How am I connected to the floor? Are my hips, hands, and shoulders connected as I initiate each movement? After taking a look and answering some of these questions, think about your own stroke. In the front end of your stroke, from 1/2 slide up to the catch and back, how do your joints move in relation to one another? Can you stay connected? Do you break or tense your arms early? Is your shoulder and upper body strong enough to connect the power coming from your legs to your hands? Do you feel or see any similarities when you press/push press/push jerk and row back to back? How’s your posture and brace at the finish? Can perfecting these movements help improve your rowing? This entry was posted in Fitness, Our Mission, Rowing, Skill, Strength and tagged balance life, endurance sports, exercise, functional movements, inspiration, mental-health, new sport, people, personal experiences, recruitment patterns, rowing, sports, Strength, training by Renegade Rowing. Bookmark the permalink.